The replacement covers on this page are for the Metal FireTech Cabinets. 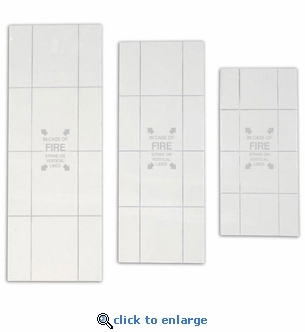 Click Here for Replacement Covers for Plastic FireTech Extinguisher Cabinets. SAC818 - For FT916 Cabinets - $14.95 ea. Panel Dimensions: 17-7/8" x 8"
SAC924 - For FT926 Cabinets - $17.95 ea. Panel Dimensions: 23 7/8" x 9"
SAC1028 - For FT936 Cabinets - $21.95 ea. Panel Dimensions: 27-7/8" x 10"